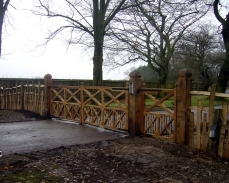 Our highly skilled fitters will deliver workmanship of the very highest standard each and every time for all types of Domestic fencing, ensuring customer satisfaction every time. 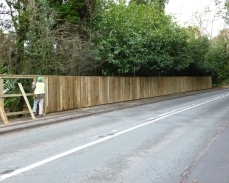 Most common use of fencing by the domestic market, effective and reasonably priced to install. 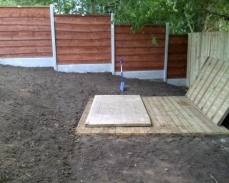 The client can select panels from a wide choice to suit.Concrete posts and base panels offer instant screening at affordable prices. This method of fencing offers the flexibility of different panels ranging from the heavy duty waneylap (*as pictured) to vertical boards or the more elaborate chevron or ribbed slats with or without trellis tops. This is the orginal method of fencing using oak or sweet chestnut split down the grain the overall effect is very attractive and blends well into the natural environment.